Was it a war zone? Was it a floor show? When we helped each other grow? And did I hurt you? Did I desert you? Did I see the world too hard? To our old bedroom in the dark? When I need you, you appear, but where am I for goodness sake? But if I called you, would that be false, too? 'Cause I just don't know how to stop...keeping the distance Will you help me? ...the distance... Can you hear me? How could I sing about the things I think about? You look at things and you ask, What can they become? Listening to your song about me made me think about how I view our relationship. I think I see the same things you do, but to me it's not a negative. It's just us. I think one main difference between us is I look at something and say, "There it is" and you look and say, "Think what it could be." I do think there is a distance between us, but mostly because we live different lives in different states, not because we have nothing to say. I think we are becoming closer mostly because you initiated it. I don't really analyze (or is it Anna-lyze) life that much. For better or for worse, I just move on through--if I bump into something I love, I move on toward it. If I don't like it, I move away. (Very deep, I know.) Since I hadn't bumped into you much, we weren't part of each others' lives. So no, you didn't hurt me or desert me - now that we're moving more in the same direction, our relationship can't help but get stronger. I envy your many creative talents and your ability to be so "out there." It's hard for me to get past that sometimes, but at the same time I'm proud of your accomplishments--your songwriting, your starting your own business, moving to a new city and making it your own. Okay, alright, now that I think about it there was some animosity there, especially when you were in your "I have the best life around" stage. I decided to take myself out of the contest by not dealing with you too much. Now I guess it's just residual jealousy. Just a pang now and then for the things you do so easily that I could never do. Now look what you've done. You've gone and made me think about things. Siblings--weird stuff! P.S. Your songs are beautiful, damn it! And here is her letter translated into song: "Sister Song 2: Amy's Response." So here is what I know about miracles. Sometimes miracles are huge, crashing things that run into a room and announce that the universe is splendid and made-to-order. And then again sometimes miracles are the smallest little thing, that happens a little bit, again and again, over years and years (say, ten), so that one day, you can look across the room at someone you love and no longer feel that painful catch in your throat. You haven't "reinvented the wheel" or "had it out" or "talked and talked till you got to the bottom of it." But rather, you just remember, like a little girl lying in the bottom bunk bed at night, that here in this very same bed, one level up, is someone who loves you--who always has and always will. One day it just isn't hard any more. And the distance is no longer something you fight against or struggle to simultaneously create and take down in spite of yourself. It's just space. It's just room to breathe, and become who you are, and who you always were, anyway. And so you step into the space between, with your heart open, and you say, "Hey, Aim, remember this? This is what old Mr. Truex sounded like when he had the runs!" and then you blow ferosciously into your hands and make this awful, horrible gastrointestinal sound. And you make your sister smile. Anna Huckabee Tull is an award-winning Singer-Songwriter with five national CDs, including the recently-released "Every Day," a collection of songs exploring the relationships between parents and children, young and old. Anna is also a Psychologist and Life Coach, with a Master's Degree in Spiritual Psychology and Applied Psychology. [More about Anna]. She lives in Somerville, Massachusetts with her husband and their two boys. Ksenia Mack did all the guitar arranging and performing on both songs (breathtaking stuff) and shares the copyright with Anna on Sister Song 2, as does Anna's sister Amy Koren. Meryl Press arranged and performed the harmonies on Sister Song 1 and did the lead vocals on Sister Song 2, for which Anna sang harmonies. 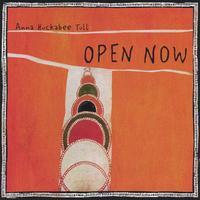 This song appears on Anna's autobiographical first CD, "Open Now" - click here to preview or purchase.